Princess Cruises Royal Princess was cruising in the Mediterranean when a large fire broke out in her engine room. Passengers assembled at their muster stations. NO abandon ship order was given. Fire was successfully put out. Ship is anchored off of Port Said, Egypt awaiting permission to enter the port. Damage and future cruises is unknown at this time. 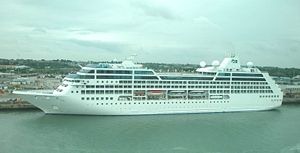 we just booked this ship going to Tahiti in October 2010. If it was on fire how can they book us on this ship??? I just came off of the Caribbean Princess that had a large crack from deck 16 to who knows where?? Is someone telling me not to go on Princess??? We are booked on this ship for a Tahiti cruise. How can they take my money when there ship was on fire? I cannot believe they did this. Please let me know whatever you hear on this ship. I extremely appreciate it. so far she has been fixed and has been sailing successfully for a while now.